Maya Plant Use: Food, beverage, spice/flavoring/preservative, oil and product use. Theobroma means "food of the gods." 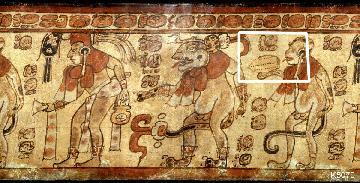 Aztec god (Quetzalcoatl) "gave" cacao to the people. Cortes drank a drink with ground cacao and achiote (annatto) (Bixa orellana) seeds combined with chili peppers and vanilla. Africa now world's largest chocolate producer. 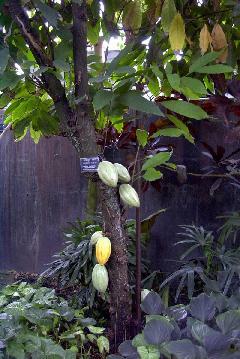 Botanical Significance: Cacao is widely known as an important product of the ancient Maya. Ritual Significance: The cacao bean was a standard means of exchange for the Maya. A glyph represents cacao and is widely seen on cylinder vessels that are believed to have held an important drink of cacao, peppers, and water. Evidence of cacao can be found in abundance in the pollen record in Maya related stratigraphy.